Barrier Group Pty Ltd presents a range of double rail U-bars in a modular single piece design featuring a fully welded knee rail. 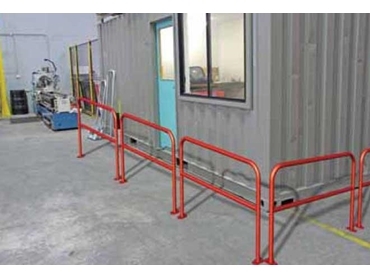 Double rail U-bars are suitable for use as pedestrian barriers at crossing points or for traffic management applications in and around factories, warehouses, schools, shopping centres and walkways. The U bars are available in surface mount or below ground models. The pedestrian barriers are manufactured from 3mm wall steel pipe 48mm in diameter and hot dip galvanised as standard. Powder-coated finish and reflective bands are available optionally. All U-bars stand 1040mm high above ground with a fully welded knee rail at 580mm high. Installation is easy with the fully welded single piece galvanised construction.